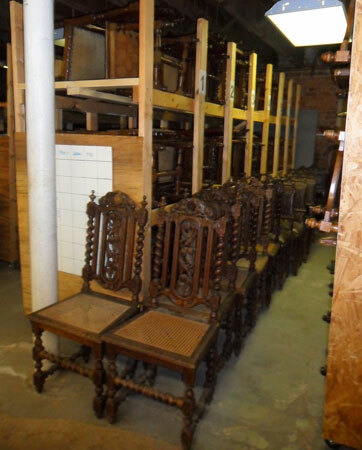 Most of the Antique Furniture deliveries for EuroLux Antiques are done by professional blanket-wrap vanline companies that specialize in moving Antique Furniture. However, Greg and I sometimes make our own deliveries in Georgia, South Carolina, North Carolina, and Virginia. It gives us an excuse to get out of the Gallery and meet our customers in person, as 95% of our sales happen over the Internet. 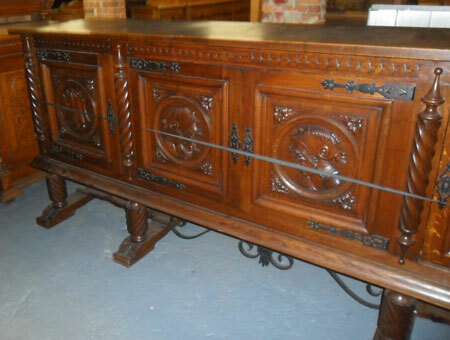 Over Memorial Day weekend, we delivered a beautiful and very high quality Antique French Hunting Buffet in oak dating to 1880 to Jerry and Rhonda’s vacation home in Asheville, North Carolina. 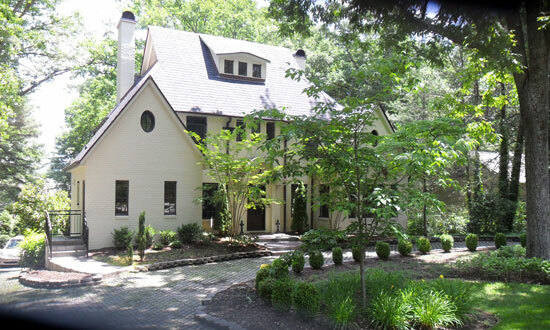 The weather was outstanding — blue skies and 75 degrees — and their neighborhood was filled with a canopy of lush, mature trees. 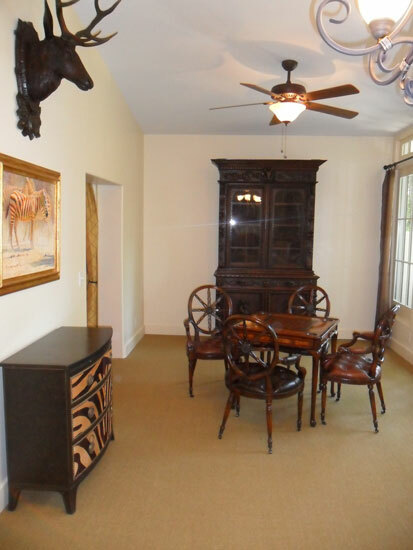 The large Antique French Buffet in the Hunting Style (on the back wall in the photo) perfectly complimented Rhonda’s wildlife design scheme for the dining area of a large Great Room, just off the kitchen. The Great Room is flooded with sunlight from the large windows, which look out over a pretty patio area. A stunning, antique hand-carved sculpture of a stag in solid oak with real horns from the German Black Forest lends a stately presence to this comfortable room. 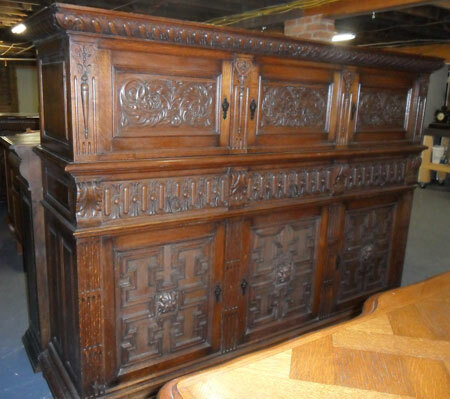 French Antique Furniture in the Hunting Style is one of our specialties at EuroLux Antiques. The Hunting Style developed during the 16th century in France under the reign of King Francis I (1515 – 1547), who is known as the great French Renaissance monarch and who ruled at the same time as Henry VIII in England. King Francis wanted an exotic way to decorate his royal hunting lodges (the chateaux of the Loire Valley). Jerry and Rhonda’s Antique French Hunting Buffet is a wonderful example of the French Hunting Style, which was very popular at the end of the 19th century. 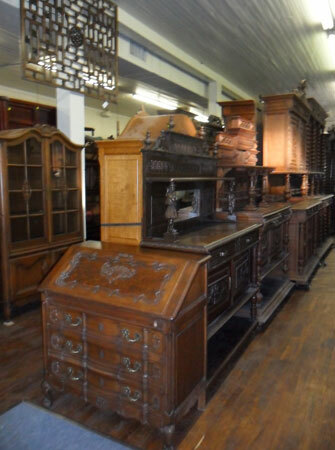 On Antique Furniture in the Hunting Style, you will find detailed carvings of lion’s heads, winged griffins, and animal trophies, including eels, fish, rabbits, deer, boars, birds, and dogs. To further the experience of the hunt, carpenters included organic motifs with lush carvings of leaves and fruit along edges of buffets and on the backs of chairs, while table bases were often carved to represent the animals of the hunt: dogs, boars, deer, and foxes. Notice that even the drawer pulls are carved in the shape of tree branches with leaves. Please let me know if I can answer any questions about the French Hunting Style for you! Thanks for stopping by! 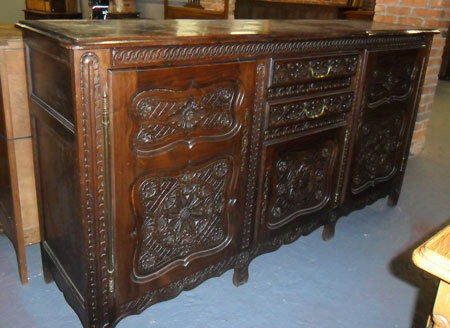 This entry was posted in Client Spotlight and tagged antique buffet, Antique Furniture, Antique Hunting Buffet, Asheville North Carolina, French Antique Hunting Buffet, Hunting Style on June 10, 2011 by euroluxantiques. EuroLux Antiques in a TV Commercial! A big shout out and huge THANKS to Joe Trainor, owner of Stokes-Trainor GM Superstore, who featured EuroLux Antiques and Downtown Newberry in his latest TV commercial for pre-owned vehicles. 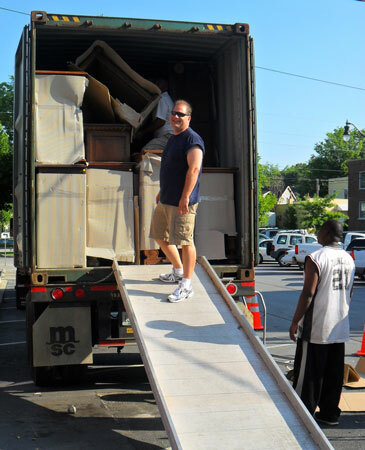 Joe has been President of our Newberry Chamber of Commerce and continues to go the extra mile to support Newberry. Our local businesses here on Main Street greatly appreciate everything that Joe does to bring folks to town and focus the spotlight on Newberry. Greg and I can personally attest to not only the great deal you’ll find at Stokes-Trainor Chevrolet, but also the integrity, sincerity, and high-level of customer service you’ll receive. Both of our EuroLux Antiques business trucks were purchased there and our family members have purchased more than a dozen cars from Stokes-Trainor GM Superstore over the years. In fact, we wouldn’t go anywhere else to purchase our next vehicle and we continue to use their service department, even after our warranties have expired. Thanks for being such a great guy, Joe Trainor! This entry was posted in News and tagged Downtown Newberry South Carolina, EuroLux Antiques, Newberry Antiques, Newberry Cars, Stokes-Trainor Chevrolet on June 6, 2011 by euroluxantiques. Welcome to the EuroLux Antiques Blog! Well hi there! Thanks for dropping by. The EuroLux Antiques Blog is a new feature of our website and I’ll post new messages on a weekly basis. It is my goal to use this forum as a way to share my knowledge of European and Asian Antique Furniture with you and to open a dialogue so that you can ask questions. I also plan to have a Customer Spotlight feature, where we’ll show photos of our pieces in their newly-found homes. 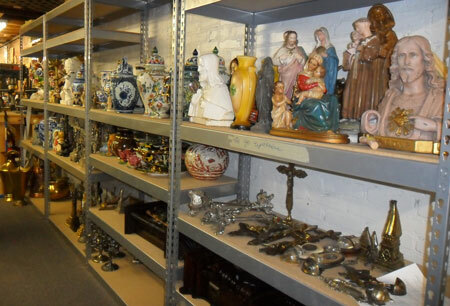 If you purchase a piece from EuroLux Antiques, we’d love to see it in your collection! Please send photos! And as you’ve probably guessed – we love animals! If you can get your pet to pose with your new piece, that’s even better! Meet my wonderful Siamese cat, Minkey. (My husband, Greg, doesn’t think he’s so wonderful — he likes to call him Stinky Minkey.) If you visit us here at our Antiques Gallery in Newberry, South Carolina, you may find Minkey in his usual place, sprawled out on the front desk. I think he’s actually smiling for the camera. So please stop by and check out our Blog from time to time! This entry was posted in News and tagged Antique Furniture, Chinese Antiques, French Antiques, Siamese Cat on June 4, 2011 by euroluxantiques.